HCM City (VNA) – A Christian bible school will be set up under the management of the Vietnam Seventh-day Adventist Church after the denomination received a permit from the Prime Minister at a ceremony held in Ho Chi Minh City on August 7. At the event, standing deputy head of the Government Committee for Religious Affairs Bui Thanh Ha stressed that the school establishment represents efforts made by the church’s management board as well as state recognition of the group’s religious activities which are in line with legal regulations and its significant contributions to local social welfare. Ha expressed his hope that along with theological training, the school will nurture benevolence, humanitarianism, patriotism and law observance among followers and dignitaries of the denomination. He also took the occasion to laud the Church’s charitable activities and efforts to protect the environment and response to climate change. The Church and its chapters have joined hands with local authorities to settle aftermaths of natural disasters, diseases and poverty. 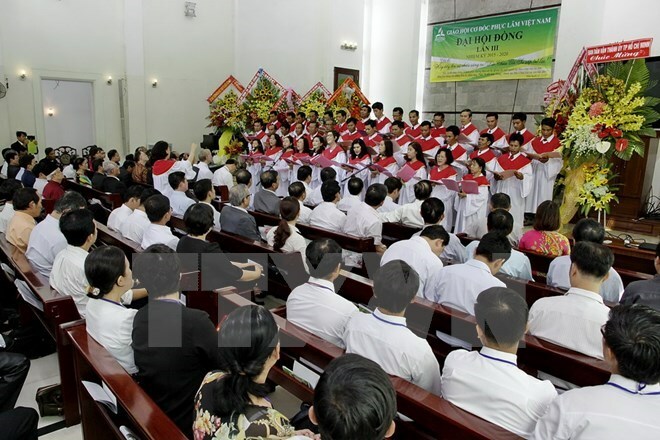 Meanwhile, Pastor Tran Thanh Truyen, head of the Vietnam Seventh-day Adventist’ Church thanked the Party, Government and local authorities for creating favourable conditions for the Church to have its own full-time training school, meeting the personnel training demands of the Church. He affirmed that in the coming time, the Church’s dignities and followers will continue to observe its motto of worshipping God, loving people, serving the Fatherland and observing the law, while actively joining humanitarian and social activities. The Seventh-day Adventist Church, a Protestant Christian denomination, was granted a licence in 2006. To date, it has 15 religious chapters and 162 groups in 33 cities and provinces nationwide.